Why didn't you just go for the food? On Tuesday, June 5th, the Super Bowl champions were supposed to go to the White House to celebrate their national title. On Monday, June 4th, the president disinvited them. The Philadelphia Eagles are highly liberal when it comes to politics, as I would assume many NFL teams are. And as we know, President Trump is highly conservative. So when the invitation was presented for the team to visit the White House, most of them were opposed; a total of 10 players were planning to go. Hearing this, President Trump revoked his invitation to them and officially disinvited the Eagles from the White House. For years it has been a tradition for champion teams to visit the White House. Sports teams from the MLB to the NCAA are all invited by the president to be recognized and celebrated. Last year, the Patriots attended the White House celebration with 34 players in attendance. That is lower than previous visits but much higher than the Eagles sad 10! So, my question for you, Philadelphia Eagles, is: Why didn't you just go? Yeah, I get it, you might not stand with your president, but stand with your team. Ten team members wanted to go, for whatever reason. Maybe they wanted to meet Donald Trump... Maybe they wanted to see the inside of the White House... Maybe they wanted to participate in this tradition. This was the Eagles first Super Bowl win and they didn't get to participate in a national tradition. I say, look at this White House celebration more like a graduation party. Ok, not all of your friends want to go, but a few do, so stick together. Are you gonna sit and talk to the host for hours? Probably not. You're gonna say hi, maybe give a hug, and then hang out with your homies around the food table. We all know you aren't going because you love the person whose party it is. Let's be real... You're going for the food. Even if you really aren't a fan of the host, at least you'll have something to talk and laugh about after. 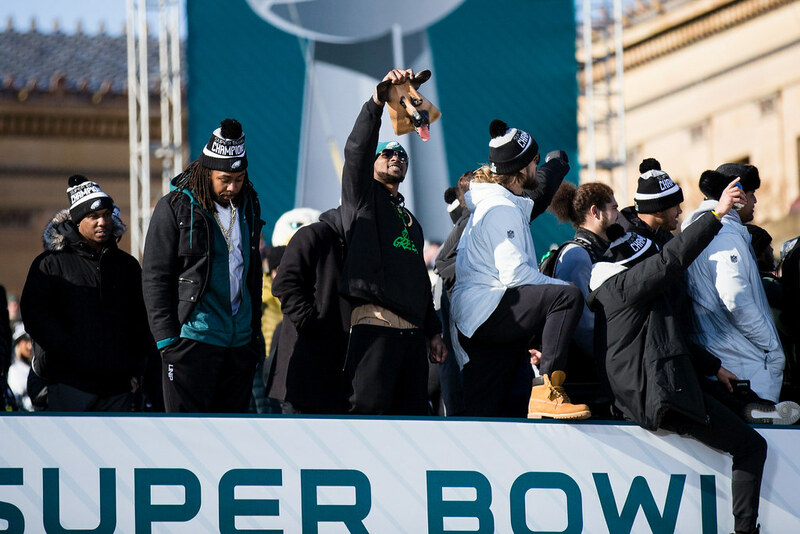 A much more positive statement could have been made regarding the Eagles and the president if the Super Bowl champs would have taken the path of least resistance and simply went to the White House celebration for the food. Take it like a grad party, Birds, it's doesn't have to be that deep. The pettiness of revoking the Eagles invitation is another story. Come on, Mr. President, this isn't your 13th birthday party. However, if one of the parties were to take the higher road I would have thought that it would have been the Eagles. Now, a trip to the White House is a little more serious than a grad party. However, you could look at the situation lightly and decide to show up as a team with your shiny silver trophy, for some extravagant White House food. Disclaimer: This article is in no way meant to support or object any political views and is not loaded with facts about either administration. It is simply how I would treat the situation if it were me invited to the White House.